(Irvine, California) March 6, 2017—Morinaga America, Inc., maker of the ever-popular Hi-Chew soft candy is giving taste buds a bit of a ‘pop’ with the introduction of the new soda-inspired Hi-Chew Fizzies. Available in Cola and Orange Soda, Fizzies takes the nostalgic flavors enjoyed by kids and adults, and infuses them into the sensationally chewy texture Hi-Chew fans love. Fizzies marks the third sub-brand addition to Hi-Chew’s rapidly expanding U.S. portfolio, after fan-favorites Sours and Bites. Cola: An homage to the original fountain soda, the new Cola chews offer real cola flavor with hints of vanilla and cherry. A slight effervescent texture on the tongue offers a refreshingly sweet experience you’ll want to savor again and again. Orange Soda: Packing a punch, Orange Soda is the perfect balance of citrusy sweetness and tang. Each bite offers a bright and bold experience that will leave you harking for the soda shop days of yore. Available nationwide starting March 2017, Hi-Chew Fizzies is adding yet another reason U.S. fanfare continues to soar for the Hi-Chew brand. With can’t-get-enough-of flavors that make it difficult to eat just one piece, Hi-Chew will continue to expand its product line with exciting new varieties in the coming year. 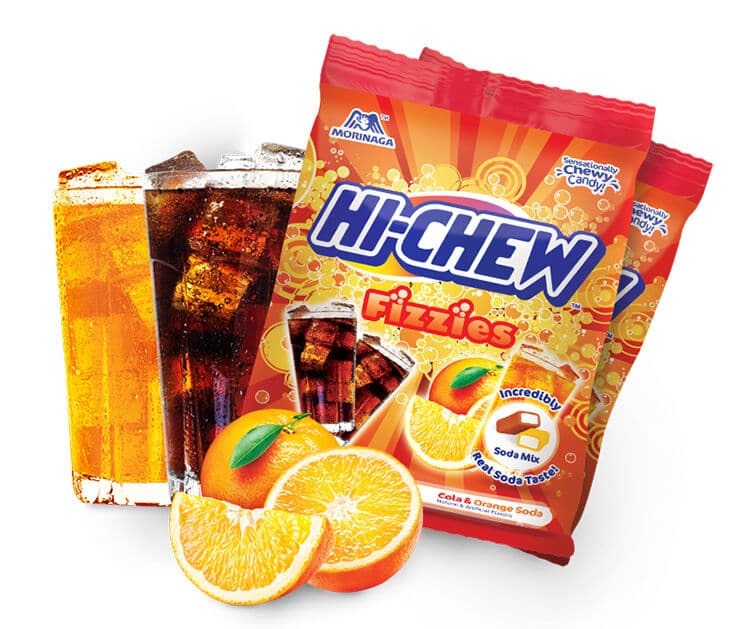 Hi-Chew Fizzies peg bags are now available at various retailers nationwide and online at Amazon.com.